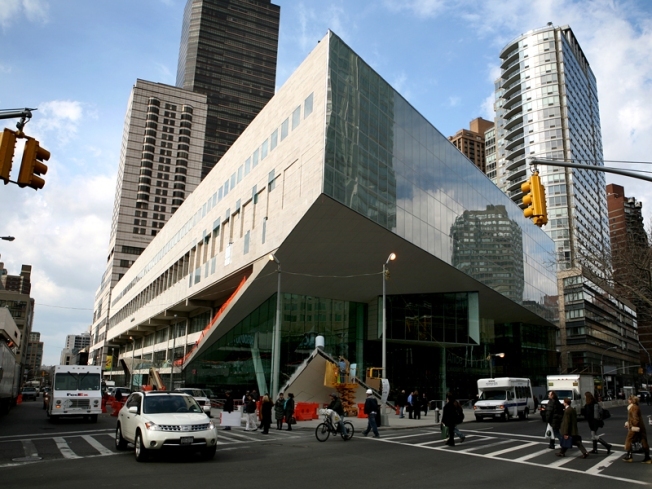 Alice Tully Hall, part of the Lincoln Center campus, reopened in February after a $159 million renovation project. Lincoln Center marks its 50th anniversary Monday. The New York Philharmonic will play Aaron Copland's "Fanfare for the Common Man" for the 50th anniversary of Lincoln Center on Monday, recreating the piece that Leonard Bernstein conducted at the arts complex's 1959 groundbreaking. The celebration begins in the gleaming new 1,100-seat Alice Tully Hall, which reopened in February after a $159 million, 22-month renovation that has been praised for its superb acoustics and design. The Philharmonic, the nation's oldest orchestra, will perform under the baton of its new music director, Alan Gilbert. Other musicians scheduled to participate in the festivities include violinist Itzhak Perlman, jazz legend Wynton Marsalis and the Juilliard Orchestra. Lincoln Center is in the midst of an ambitious redevelopment of its 16-acre campus. Fifty years ago, President Dwight D. Eisenhower stood at Columbus Avenue and 64th Street and pushed a shovel into the earth to break ground for Lincoln Center for the Performing Arts. The sprawling arts complex was a catalyst for urban renewal and played a significant role in reviving its Upper West Side neighborhood. It is the country's largest performing arts center, home to 12 resident groups including the Metropolitan Opera, New York City Ballet, New York City Opera, the Philharmonic, the Film Society of Lincoln Center, Jazz at Lincoln Center, and the New York Public Library for the Performing Arts. Hosted by Tom Brokaw, the program will highlight Lincoln Center's half-century milestones. Alice Tully Hall is the first building to be completed as part of the center's $1.2 billion redevelopment, with $940 million raised so far. The overhaul includes a new pedestrian bridge over West 65th Street connecting the main campus with the building that houses Alice Tully Hall and the Juilliard School. The main staircase and promenade at Columbus Avenue will be named after the late soprano Beverly Sills, who was chair of Lincoln Center and the Metropolitan Opera. The fountain in Josie Robertson Plaza, between Avery Fisher Hall and the David H. Koch Theater, will be updated with new lighting and a sleek design. A new visitors space and information desk near the main staircase will open in the fall, and a new restaurant with a sloping roof is planned near the reflecting pool at the rear of the plaza. Avery Fisher Hall, home to the Philharmonic, has been approved to receive an interior update, but no date has been set for the work. To help raise money for the remaining projects, Lincoln Center has entered into a five-year agreement to host Fashion Week in its plazas and theaters, beginning in September. The twice annual event has been held under tents in Bryant Park behind the New York Public Library since 1993. Officials say the redevelopment is geared to make Lincoln Center a more open, accessible and vibrant urban destination.